In order to get ahead, to succeed, you need to collaborate with someone, with others. The original thought was a sole trader can work on their own but they can’t, they need to network, to apply for work and they have customers. The larger the organisation the more difficult is to collaborate, divisions can be aptly named as the need to fight for budgets, staff, equipment and so on is increased. All too often silos are formed which are very effective barriers against collaboration. A small business simply by being small will generally collaborate by default – small number of staff, small space and limited resources – all factors dictating work practices. 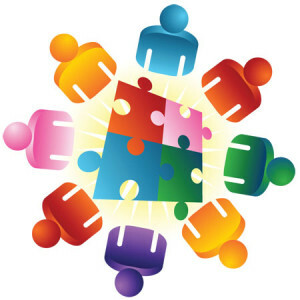 The larger the organisation the greater need to collaborate. To ensure an organisation’s message is clear, is heard and delivered all departments must work with one another and this must start at the top, in the C-Suite. So much is being communicated about the communication within the executive area, CFO and CIO, CIO and CMO and on it goes but regardless of the middle letter, all chiefs need to be singing from the same hymn book. Each chief will have a different focus for their department, that is inevitable but it must contribute to the overall goals of the organisation. Like a jigsaw all the pieces must fit together to form the big picture. One of the goals for any organisation today is providing a positive customer experience and given all the information which is now available to customers to make informed decisions, attracting customers and keeping them is no easy task. At all levels customers must feel loved and wanted from the initial phone call, to sales, to the accounts department to customer support. If one area drops the ball the customer will look at other options and the danger is, they will find a better one. If there is disunity, disorganisation or dissention within, it will most certainly be felt outside. If staff are unhappy they will find it difficult to convey a positive front for the customer. If staff are in a disorganised state how can they possibly assist the customer effectively? No matter what problems within an organisation very rarely stay within. Cross pollination will always breed a stronger plant, the same goes for an organisation which regularly has teams comprised of various department members, each bringing their own skill set and knowledge to the table, working together on tasks. This knowledge share also makes another department aware of others issues in turn developing a much stronger understanding of the organisation in general. Bringing departments together shares responsibility and feeling responsible also creates a sense of ownership, ownership engenders pride in doing a job well. Sharing skills, knowledge, responsibility, a sense of ownership and all this because of collaboration and it all adds up to a positive outcome. The future is clear, if you don’t want to collaborate or co-operate the best thing to do is clear out.